The companies plan to promote the use of spheroidized tantalum in 3D metal printing. Global Advanced Metals Pty Ltd (GAM), which makes tantalum and niobium products, and LPW Technology (LPW), which makes metal powders exclusively for additive manufacturing (AM), have joined forces to promote the use of spheroidized tantalum in 3D metal printing. ‘Across this emerging industry there are few examples of additively manufactured refractory metals, and a need exists for a more thorough proof of concept and development of print criteria,’ GAM said. 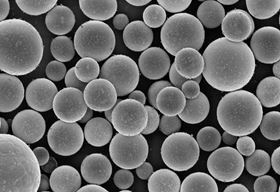 The company makes powders in nodular, angular, fractal and spherical morphologies for a range of applications, and a successful demonstration of laser 3D printing of tantalum could offers end users another powder option with which to serve medical, dental, military, aerospace and other markets. Tantalum reportedly offer superior osteointegration, higher biocompatibility and reduced stress shielding with respect to current metals and alloys used for medical implants. ‘We can now measure and share physicochemical data for both our spherical tantalum and the resulting 3D printed part and bring this solution to our partners, for example practitioners, designers and manufacturers of tantalum based surgical implants and other high reliability and critical devices.’ said Andrew O’Donovan, CEO of GAM. ‘This work will further develop understanding of the factors affecting tantalum powder spheroidization and how it performs in the AM process, adding assurance to metal AM producers of the material compatibility for AM production,’ said Ben Ferrar, LPW’s COO. This story uses material from LPW, with editorial changes made by Materials Today. The views expressed in this article do not necessarily represent those of Elsevier.